Home / Licensing / Is my Australian Driving License valid in Sri Lanka and how do I apply for my International Driving License for Sri Lanka? 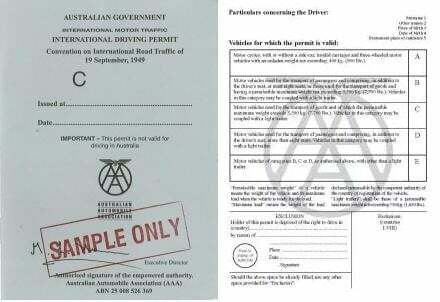 If you are planning to drive around in your own glorified lawnmower, tuktuk, car or even scooter during your holidays in Sri Lanka with a bunch of tinnies, it is important to know that your Australian driving license is not valid in Sri Lanka. In order for you to drive your own car, scooter or tuktuk in Sri Lanka you need an international driver’s license, also known as an International Drivers Permit or IDP. See below for how to arrange your own international license. You can only apply for your International Driving Permit via the AAA or Australian Automobile Association. If you are in a rush, you can book an appointment with the State and Territory Motoring Club near you. Fill out the application form, bring a passport photo and don’t forget to bring your license. If you are not in a rush, you can easily apply for your IDP online. Make sure to upload a passport photograph and good photos of the front and back of your license. Example of an Australian IDP. Regardless of the process, your International Driving Permit will be posted to you on the address you provide and will cost about AU $39, excluding postage fees. Carrying your International Driver Permit, you are only one small step away from obtaining your Sri Lankan driving license. If you wish to organize it yourself, make your way down to the Automobile Association of Ceylon (also known as the AAC) office in either Colombo or Kandy. LKR 4400 (around $25 USD, keep in mind that the exchange rates fluctuate!). Your passport (hard copy), driving license (hard copy) and your visa, just in case! A pinch of patience for the Sri Lankan system. Although this is generally a relatively fast-moving process, during peak hours you might have to wait some time for your license to be ready. Don’t worry, the office is air conditioned! If you wish to not spend valuable time in a government office while you could also be spending that time sipping a fresh coconut on a beach, or if you are not planning to go to Colombo or Kandy, you can also let us arrange your Sri Lankan license and/or your IDP. Make a booking with us on our website and we’ll organize your Sri Lankan license for you upon arrival! For more information on and the details of arranging an International Driving Permit in Australia, visit this website. And for a little bit of help navigating the Sri Lankan licensing institutes, check this link!